I gotta visit the coffee shop you go to! I want to know whats IN the coffee. GF: That would be a little cantina in Mos Eisley. Great house band. Craniac: A large shot of Tranya. Oh God, I'm geeking out and using mixed fictional universe metaphors. It's late. G'night. That's okay Ed. Right now Barry Obama thinks he's John Wayne. I get most of these sketchbook character from my forays into town on MARTA, the mass transit system here in Atlanta. 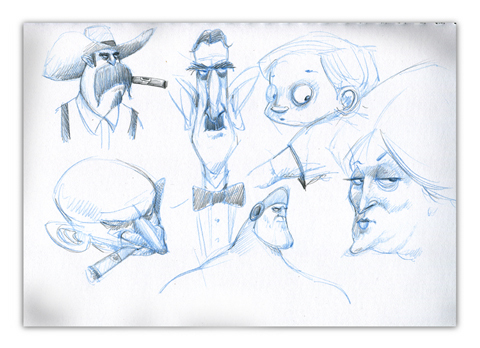 There's nothing like shuffling along among the huddled masses to inspire a page of peculiar caricatures. I'd get WAY too much attention at a coffee house. When I try sketching at cafe's. it seems a bit stale and people generally TRY to look hip. YAWN. Are you planning on discussing this further in more posts? Found your site on another blog post, great content, but the site looks awkward in Chrome, but works fine in IE. Go figure. I have been exploring for a little bit for any high-quality articles or blog posts on this sort of area . Exploring in Yahoo I at last stumbled upon this site. Reading this info So i am happy to convey that I've a very good uncanny feeling I discovered exactly what I needed. I most certainly will make certain to do not forget this web site and give it a glance regularly. A key concept of targeting your application employs emphasis to be made on the roles and responsibilities listed in your generic CV that are relevant and relate directly to the advertised post. Hey there! I’m a initial time reader of one's webpage…wanted to allow you already know that its extremely informative and to help keep up the excellent operate! Seeking ahead for your long term content articles! I’ll right away grab your rss feed as I can't find your e-mail subscription link or newsletter service. Do you have any? Kindly let me know so that I could subscribe. Thanks. Just a question. Do you feel you could add just a little a lot more within the way of content here? I believe youve got some interesting points, but Im just not sold. In the event you truly want to get the crowd behind you, youve got to entertain us, man. Maybe you could add a video or two to drag the message property. Write a lot more, thats all I have to say. Literally, it appears as though you relied on the video to make your point. You clearly know what youre talking about, why waste your intelligence on just posting videos to your blog whenever you might be giving us something enlightening to read? I have been looking through similar blog posts in this topic. Not many of them are good with writing skill and quality, but yours is an exception. I would like to read more of your writings on this subject. Your writing has definitely inspired me to change the way I write. I really appreciate your hard work. You positive do know what youre talking about. Man, this weblog is just wonderful! I cant wait to read much more of what youve got to say. Im actually pleased that I came across this when I did because I was truly beginning to get bored with the whole blogging scene. Youve turned me around, man! Youre so awesome, man! I cant believe I missed this weblog for so long. Its just great stuff all round. Your design, man...too amazing! I cant wait to read what youve got next. I really like everything that youre saying and want more, far more, More! Keep this up, man! Its just too very good. This page contains a single entry from the blog posted on May 10, 2011 1:54 AM.